The Adidas Ace 17.1 provides the foot a comfortable lock-down, some reviewers reported. Most of the reviewers loved the sock-like fit of the soccer cleat. Majority of the reviewers liked the lacing feature of this football boot which helps create a more customized fit. Several commenters appreciated the traction that the football cleat provides. 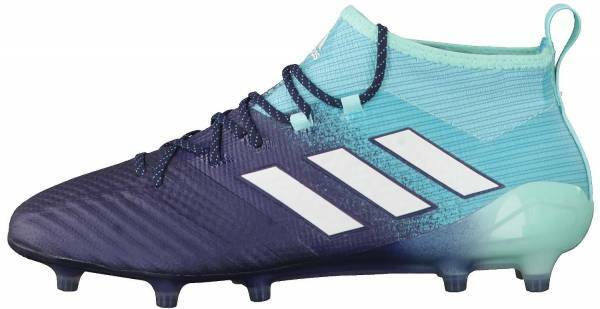 A number of users stated that because of the PrimeKnit and ControlSkin technologies, the Adidas Ace 17.1 men’s cleats have a barefoot feel and the touch is much closer to the ball. Most of the buyers felt that men’s version these premium football boots are worth investing in. A handful of reviews indicated that the Adidas Ace 17.1 runs true to size. A few users reported that a slight pressure is felt in the upper where the ControlSkin meets the Primeknit material. Some reviewers said that the ControlSkin upper can feel a bit stiff initially but becomes softer after break-in. A couple of buyers were not satisfied with the durability of the women’s version of the soccer shoe as they started falling apart after several weeks of use. Essentially an improved version of the Adidas Ace 16 line, the Adidas Ace 17.1 contains just the right amount of changes to make an already great line better. This football boot has a snug sock-like fit without losing comfort. Although quite expensive at $200 a pair, these cleats deliver in terms of traction and control. While durability has been proven with the men’s version of this soccer boot, some players were unsatisfied with the women’s version of these football shoes. Adidas introduced new version of Ace line, numeric like 17th version. In this review, we will discuss the quality of the Ace 17.1 PrimeKnit model equipped with FG/SG soleplate based on my personal experience. To be honest, Adidas did not miss at all by launching this colorway. From the moment I saw them, I wanted them. Also, when I first wore them, everybody said "nice". I felt good while wearing them. I felt good while receiving the compliments, so you know that "they work", and you hit the right spot. I really like this vibrant color. It makes me satisfied by knowing where my feet are since it’s more than visible. I also like the design and honestly, there is nothing negative to say from my side. One-piece construction is very welcoming, and I support that trend. You can clearly see that a lot of effort has been put, because a design this good, can’t be made overnight. When it comes to this model, I don’t see any other option where tech-fit collar should be excluded. Without it, there would not be a sense at all. Aside from that, it also plays a big role in general performance. It is made out of highest quality material, so durability is not something that you should be worried about. The fit is great so you can expect very good lockdown with great feeling for the ball on every part of the foot. Everything is packed so well that at some point you will ask yourself, "am I barefoot?" The design of the collar is not as same as on X17.1 models, but it plays pretty much the same role and it holds everything in place. This is the most important part of the shoes, and as well, the one who gets the most attention. For this model, Adidas choose to go with PrimeKnit technology and by experience, I can say that they did the great thing. By using the PrimeKnit technology, these boots offers a great fit. The PrimeKnit is not softest material, however, it stills manage to give you an absolutely good feeling for the ball. By wearing these shoes they oblique themselves for your feet by the time, but in general, the shape will stay the same. I did hot water trick always before training to soften the boots, but it is just a minor change. They will not act like Ace 15.1 leather, which I had the opportunity to wear. Since this model comes in two versions, with laces and laceless, I need to tell you about my experience. Adidas had that in mind and did not put the laces without deep engineering. They have been put so precisely that I have never had a problem when it comes to fastening. I always had full lockdown, and I never had a bad experience when it comes to touch as well. The padding behind the laces is thin enough so I never had problems when striking the ball hard or passing. The only complain I had would be the shoelaces untying often, but that could be fixed with hot water, and laces cleaning. Soleplate is pretty much the same thing with almost every Adidas model. On this model, they also went with a redesigned Adidas SprintFrame model, which has been successful for many years, but in my opinion, it is not the best available. Prior to training, I always did hot water trick, and I was trying to crease the boots. Soleplate seemed very flexible, as almost as Adidas Predator Instinct 2014 WC which I wore, but on the pitch when I did sharp turns, it felt very stiff. It is not a strange thing that heel stiffness can be found on mid-cut collar shoes like it was also cased with this model, but by the time that feeling disappears. However, stiffness will not disappear. In general, the SprintFrame is rigid and you should be able to move elegantly on the pitch. Sharp moves should not be a problem as well, but it depends from one person to another. Even with SG studs, on rainy weather, I founded myself laying in the mud very often. It did not give me all the necessary traction in a little bit worse conditions. I also felt stiffness in all weather conditions. In general, this is a very highly rated football shoe model, so it is expected for them to be good in every aspect. I wore Ace 16.1 Laceless, Ace 15.1 leather, and this is my third model from Ace generation. From my experience, I can say that I was more satisfied with leather ones. I need to say that on a bit harder natural grass pitch and on an artificial grass pitch, I had many problems with blisters with this model and laceless model. It is not the case with leather one's model. Toes, plantar, and heel area, everything was painful. I get blisters on these areas, especially when making repetitive sprints and sharp turns. Overall, these are very good football boots. It is simple, and it should be like that. They will provide you nice lockdown, good feeling for the ball, nice feeling when shooting or passing, good traction etc. I personally think they suit the best to midfield players as they are designed to since it does not feel great to wear them while doing many short sprints or many sharps turns compared to Adidas X17.1. Quality of these boots will not disappoint you at all. If you see all the pictures I posted above, that's how it looks like now after a year of using these boots. There are only minor usage spots which will not affect game performance at all. When it comes to sizing, I did not have any problems. I went with 9 ½ UK / 44 FR(EU) and I got full lockdown and sock-like feeling, so I can easily say that these can be marked as true to size model. You really notice the transition point in terms of the upper being much firmer where you have the control skin material which is good in terms of responsiveness. But again, it's really not the sock like sensation that a lot of people expect. It's got a lot of firmness in the heel area as well along the very back which is not a bad thing but more of a personal preference. It's a fairly comfortable shoe, there's not a lot to break in, there's not a whole lot to get used to. The heel is, I will admit, is a little bit stiffer than the average low cut shoe just because it's a stranger cut across the back in comparison to other mid-cut models. Building from the previous football boot model, there were several changes showcased into the Adidas Ace 17.1 Firm Ground football boots. This model features a women and men’s version as well. Starting with the upper of the men’s version of these cleats; instead of having a full PrimeKnit cover like its predecessor, this model fused it with a new technology called ControlSkin - this material has been primarily placed in the midfoot while the PrimeKnit covers the toe-box. For women, the Adidas Ace 17.1 features a Kangaroo leather forefoot with a PrimeMesh on the quarter. Being the only model featuring a lacing system in the Adidas Ace 17 silo, the Adidas Ace 17.1 men’s model features three lace holes above the toe box to create more stability to the boot. The women’s version features a traditional lacing system. While the tongue is non-existent for the men’s version, it has a PureCut control fit collar which is elasticated and helps the foot slide in and out of the boot. A pull-tab on the heel is also available to slip into the boots with ease. The inside of these firm ground football cleats features a synthetic leather liner that adds comfort when worn. The soleplate utilizes the SprintFrame technology which was also used in the Adidas Ace 16 line. With the lacing system included in the Adidas Ace 17.1 Firm Ground, it has a customized and snug sock-like fit. 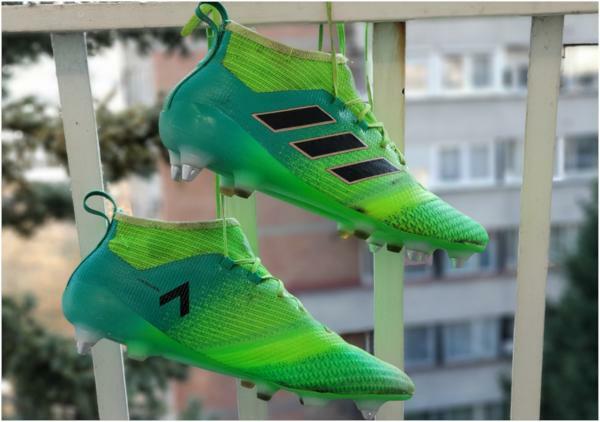 The lacing system found is similar to that of the well-known Adidas Predator 18.1 FG as well as the Adidas Predator 19.1 FG cleat. These football shoes are available in men’s sizes 7 to 10.5. And the women’s version is available in sizes 5 to 10.5. Making small but notable changes to its predecessor, the Adidas Ace 17.1 for men still, features a PrimeKnit upper with the addition of the ControlSkin technology in the midfoot. The PrimeKnit offers support by wrapping the forefoot all the while maintaining comfort. It also helps keep water and debris out. On the other hand, the ControlSkin, which is a thinner and more structured version of the PrimeKnit, covers the midfoot. This technology makes sure that the football boot has a snug fit and ensures lockdown. Furthermore, the upper for the women’s version is kangaroo leather and a PrimeMesh quarter. This combination ensures comfort and a sock-like fit to help the player move with instinct. Utilizing the SprintFrame outsole, this football shoe is extremely lightweight and can hold up to high speeds while maintaining stability. Designed for firm grounds, the shoe features the Total Control stud alignment which is made out of conical studs. The stud design allows for free movement without being stuck in. Furthermore, while the soleplate is stiff, it still has enough flexibility in the toe box. Cleats drenched in the Pyro Storm colorway looks fiery on the pitch. The color selection includes a color combo of Solar Orange and Black. Models including the Ace 17+ Purecontrol, the Copa 17.1, the Nemeziz 17+ Agility as well as the X 17+ Purespeed sport these colors with different color arrangements. The Adidas Ace 17+ Purecontrol, for example, is predominantly orange with bold black Three Stripes logo. The eclectic look of the Dust Storm color pack manages to blend with the sleek makeup of the Adidas Ace 17+ Purecontrol. The upper is bathed in a fade-away effect with the collar area sporting the darkest hue from the palette. On the forefoot area moving up to the midfoot, a milky shade is used. Breaking away from the neutral hues is the silo and brand’s neon-colored logos, which are integrated into the medial side and front part of the collar area. The Energy Aqua color pack has more or less the same feel with Adidas’ Dust Storm color pack. This color scheme also makes use of a gradual fade-out effect starting from the forefoot area to the collar. The colors used, however, are ocean hues from a Legend Ink to an Energy Aqua shade. The brand logo, on the other hand, manages to stand out with its white coloring. Players including Mats Hummels, Manuel Neuer, Aaron Ramsey, Keylor Navas, and several others sport the Adidas Ace 17.1. The men’s version of these boots is available in several colorways including PyroStorm (Solar Orange, Black and Metallic Gold), Ocean Storm (Energy Aqua, White, Legend Ink), Magnetic Storm (Core Black, Utility Black), Dust Storm (White, Solar Yellow, Core Black) and Turbocharge (Solar Green, Black).